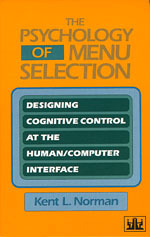 Prototyping and Evaluation of Menu Selection Systems (chapter 12). Given the emphasis on HCI and psychology one might easily think this is a relatively recent volume on IA and usability. In fact, this book was published in 1991! I find it amazing how appropriate much of the content still is. It’s also very interesting to compare the developments over the past two decades to the predictions discussed in chapter 13, The Future of Menu Selection. You can buy the book from Amazon or read the complete book online (also on Google Books). I used the approximate analogies of menu = navigation, system = site, frame = screen and item = page in the translation. The original cross-references to the relevant sections in the book are included next to each guideline. Many thanks to Kent L. Norman for his inspiring book and for providing free access to it online!